We had a visit from a Keralan sadhu, Swami Krishnananda, who came in a tourist bus loaded with his disciples for a tour of north Indian pilgrimage sites. He has come to SRSG before, but this is the first time I had the occasion to see him. He is an enthusiastic kirtaniya with a powerful voice. 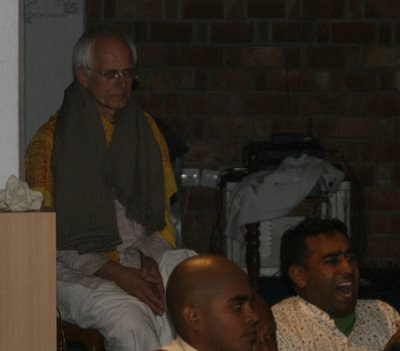 I was not there when he started his session, but Swami Veda was. Swamiji sent for me, saying that I would not want to miss this. Krishnananda was doing Krishna bhajans at the time. 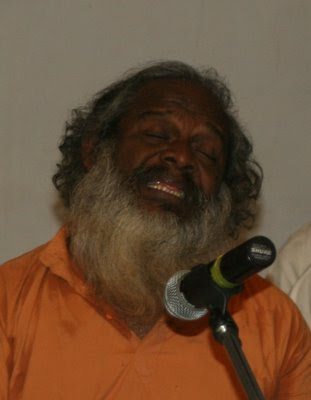 He often sings a Sanskrit stotra solo and then breaks into a Malayalam, Sanskrit or Hindi bhajan to which his disciples are an equally enthusiastic chorus. 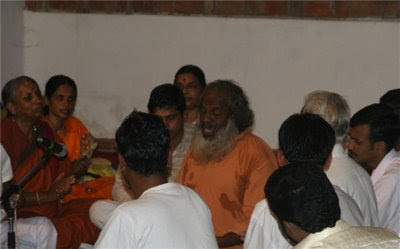 Afterwards, Swami Veda gave, as he often does for visiting performers and sadhus, a token of appreciation. 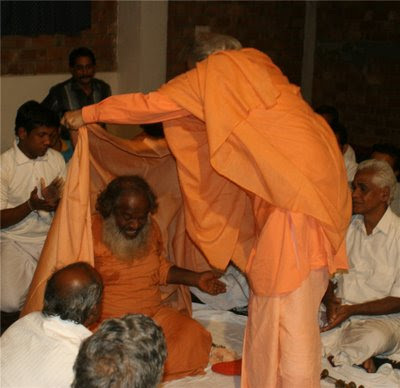 You can get a glimpse of Swami Krishnananda's personality from this picture. Someone snapped this picture of me during the kirtan. I look pretty meditative. Likely it is because soon after I arrived, the Swami started doing kirtan for Rama, Shiva and other demigods--even the Navagrahas. So I was appreciating his voice, but not so much the content. After the performance, we went up to Swami's dining room to eat. Krishnananda Swami and I were introduced. He took one look at me and said, "After eating, we will go back downstairs and do 15 minutes of Hare Krishna. And you must dance." He spent about five minutes eating and then was madly off in all directions. Surprisingly, Swami Veda also came downstairs into the meditation hall and contrary to habit, did not sit in his vyasasan type chair, but on the floor. He said of K.S. that, "Most people start kirtan slow and work up into high gear, but you start at top speed." In Mayapur, the kids used to call me "Rail Gari" because I led kirtans as though I was driving a train. Anyway, that is the way Krishnanandaji led the Hare Krishna kirtan. There was no getting out of it. I had to dance. And soon everyone was whirling around like a bunch of dervishes. Men and women. As a matter of fact, the rather grave looking woman to the far left of the Swami in the second picture above was a rather impressive figure with a lot of elegant moves. Swami gave of himself energetically. I, as a participant in that divine gathering at Ramasram still remember the ecstatic experience during Swamijis bhajan. Thank you Jagadanandji for the nice description of the event.